I confess I’d never heard of IDRAC, before I was approached with an invitation to speak by Sister Patrice Colletti (Sister Abeyante in Second Life), but the opportunity intrigued me as someone who had almost zero experience of Second Life. And, while I’d been aware of the historical use of virtual worlds by people with a range of disabilities to spend time in, freed from many of the physical and attitudinal barriers of the physical world, I wasn’t sure just what relevance and role virtual worlds still had these days in people’s online activity, particularly with the rise of mass-market social networks. I took the easy way out, and suggested a question-and-answer session rather than giving my own presentation. So we put together a set of questions, and I prepared my answers in advance. 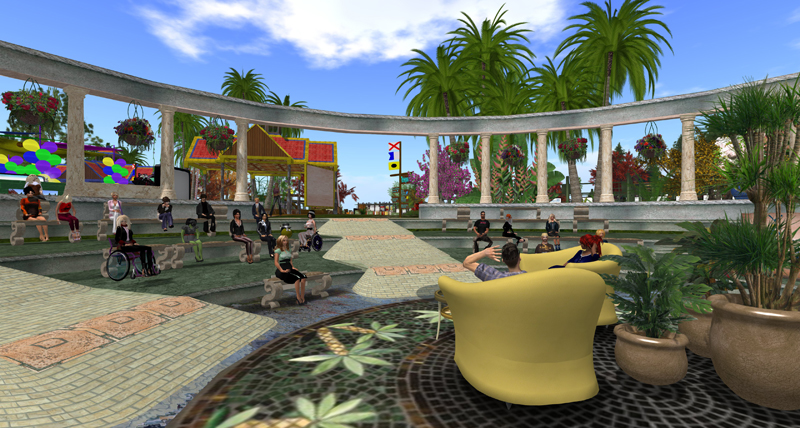 I was given some valuable advance training by iSkye Silverweb on how to manipulate my avatar in Second Life, and how to avoid social fails like flying onto the stage while someone was presenting, or sitting down on another avatar’s lap. On the day, I made my way to the virtual conference theatre, and sat in a nice comfy chair where we conducted the interview. I placed my pre-written answers into the chat stream, which I read aloud for those who preferred to listen rather than read. It was a great experience for me, I learnt loads, and it made me think a lot more about virtual worlds, how people with disabilities make use of them, and how virtual worlds might inform our views and activities in supporting inclusive user experience design. Open air conference venue – at least it didn’t rain! The IDRAC 2014 speaker schedule included a great set of presentations, including one from my friend and regular co-author Brian Kelly. Unfortunately due to other commitments and time difference issues, I wasn’t able to stick around to take part in the rest of the conference. But I’ll be putting next year’s in my diary, and I definitely recommend the conference as something to get involved in, if you’re interested in broadening your thinking about accessibility and UX. So, thankyou Sister Abeyante, iSkye and Gentle Heron for your invitation, help and support, and to the audience for your participation! I’m the tattooed one on the right, looking unusually relaxed for a conference speaker. In case it’s of interest, I’ve posted here the questions I was asked, and my answers below. 1. Perhaps begin by explaining how much of the ICT and even the disability/accessibility advocacy world has often focused on “checklist accessibility” (and why), but you have focused on the “accessible user experience.” What’s the difference between them? Why is it important to include a focus on accessible user experience? That’s a great question to start with, as thinking about user experience over checklist conformance something I’ve long believed is really fundamental to accessible digital product and service design. It’s also something that’s the primary focus of my work with The Paciello Group. Don’t get me wrong—accessibility checklists and guidelines are very helpful for designers and developers. They help to define things we know about accessibility, and they can be useful as ways to measure and compare digital resources against some baseline of acceptable accessibility. If they’re sufficiently authoritative, they can be used in formal documents, in policy and legislation. Some checkpoints can be integrated into automated evaluation tools that check code. This is an important part of good system development. Unfortunately, many checkpoints and guidelines need human interpretation. Automated tools just can’t check for everything. Accessible user experience is about involving people with disabilities in all stages of the design and development process, and making sure the process is set up to support this. It’s about making sure that whatever’s being designed is created in a way that helps as many people as possible use it successfully, regardless of disability. It means having a clear understanding of what “successful use” is. It means understanding what problems someone with a disability may currently have in trying to complete tasks or achieve the goals a product or service is intended to support. It means designing to minimize these problems, working with people with disabilities as much as possible, over making assumptions of their needs. And it means prioritizing successful engagement over compliance with standards. 2. Do you have any compelling examples of where companies have successfully involved people with disabilities in the design of digital experiences? What has been the “win-win” when this occurs? We’re still at a fairly immature stage in really involving people with disabilities from the start of design, so examples are not easy to find. So, where progress has been made, it’s usually through hard work fixing accessibility barriers later on in the design lifecycle, rather than designing to avoid them in the first place. And in almost every example I can give, there will be room for improvement somewhere. But there are plenty of web sites and applications that have noticeably improved due to a better focus on accessibility. For example, the BBC paid a lot of attention to people with disabilities during the design of their iPlayer application for online TV watching. Also in the UK, the Government Data Service (GDS) created gov.uk. This is a single web site for UK citizens to access a wide range of government services, and performs well from an accessibility perspective. Despite a short timeframe and limited budget, the GDS team managed to adopt a very progressive approach to user-centred design, including a strong focus on people with disabilities. And, of course, there are plenty of examples from the physical world we can use to inspire us—examples of where a focus on disability has led to a better experience for lots of other people. For example, captioned TV helps people who are Deaf and people who are trying to watch in a noisy bar. A few years back, a former colleague of mine, Graham Pullin, wrote a terrific book on this topic—Design Meets Disability—which I highly recommend as an inspiration for product design teams everywhere. 3. Do you think that digital accessibility standards in the IT and web industry have improved over the years? I’d say there has definitely been an increase in awareness in recent years. Certainly there’s more recognition of the importance of conformance with accessibility standards such as the W3C Web Content Accessibility Guidelines or the Section 508 standards. There’s also more demand from customers for accessibility from web site, app and software suppliers, although it’s not often clearly articulated. So suppliers are motivated to do something about it, even though that focuses on conformance rather than genuinely improving the experience for people with disabilities. Some accessibility barriers that were previously commonplace are disappearing. But others, such as poor usability for people who can’t use a mouse, are still frustratingly present. And one recurring problem we have to deal with is the relationship of accessibility to emerging technologies and development approaches, where accessibility considerations can be forgotten about or considered not to be a priority. On the Web, HTML has historically supported good accessibility. But developers are always finding new, creative ways to make use of existing technologies to do new, cool things, and they often leave accessibility behind. So, everyone’s playing catch-up, even the people producing standards for a modern Web. This means that we accessibility advocates end up running in order to stand still, so to speak. We have to find new ways to modify emerging development practices to make sure accessibility requirements are met. And the assistive technology providers often also have to modify their products to react to these changes, which takes time. 4. What role do you see disability rights legislation in raising the accessibility of our digital landscape? First, as a basis for disability rights legislation around the world, I think it’s incumbent of everyone who’s involved in the creation of digital products in whatever shape or form to be familiar with the UN Convention on the Rights of Persons with Disabilities. This encapsulates just how much people with disabilities—and the world in general—stand to gain when we create accessible digital environments. I’ve already mentioned Section 508 of the Rehabilitation Act, and its influence in the US, and globally, is definitely worth restating. 508 applies to US federal organizations, and restricts what technology they can procure and provide to their employees and customers. Suppliers aren’t directly covered by the legislation, but it’s in their interests to meet the 508 standards in their products, so that they can continue to sell to federal agencies. And, if they make accessibility improvements to their products in order to continue to access this market in the US, these improvements are also available to customers across the world, who also benefit. So procurement-focused accessibility legislation definitely has some power. The revised Section 508 standard, due for publication soon, and the Twenty-First Century Communications and Video Accessibility Act (CVAA), also have the potential to influence the quality of accessibility of digital products.They both place responsibility on organizations to involve people with disabilities throughout the product development process. That’s a way of trying to move focus away from just compliance to improving the quality of the design and development process. I really believe that makes for better experiences for people with disabilities. 5. What about the quality of tools people use to create and access digital content? Are these sufficient to support accessibility for people with disabilities? This is still a challenge. We have some very powerful tools—things like corporate content management systems, blogging tools, even social media sites, that allow people who wouldn’t consider themselves Web developers to publish web content in different formats. This is great. But from an accessibility standpoint, we’ve focused a lot on the quality of the output of these tools, but less so on the quality of the authoring process. The result is that although most tools can be configured to create fairly accessible output, often this means using settings or features that might be hard to find, or not switched on by default. So many users won’t be using the tools in an optimal way. And some tools just don’t make it easy to create accessible content out-of-the-box. 6. What are your views on the role education and training has to play in improving accessibility of our digital landscape? I think education is critically important for improving digital accessibility standards. But, as a former educator in digital accessibility at a university, I get uncomfortable when we just focus on tertiary education when we discuss accessibility education. Sure, digital accessibility should be treated as a core skill in computing science, digital media design, and associated subjects. But we can’t expect that all of our digital designers and content creators of the future will have a technically-oriented college or university degree. We can’t expect the same of the people who commission or purchase digital resources, or manage the creation process,. That’s the beauty of the Web. It gives all of us the potential to create and share stuff, without needing a computing science degree! But I do think we need to be better at emphasizing human diversity and what it means for design, when we teach digital literacy. And we need to be doing this everywhere, in schools and colleges, and in more informal educational methods. Books, online articles, tutorials, code repositories—anywhere that people can learn how to make digital stuff—there’s a responsibility to demonstrate good practice in accessibility. Without that, poor practice is propagated, and accessibility continues to be seen as something optional or a specialism. 7. Can you tell us how you arrived at a career in digital accessibility? Actually, I started off my professional life drawing long and winding roads…my vocation as a kid, and my first career was as a cartographer. I spent four years helping to create the world’s first totally digitally-derived world atlas. It was fascinating work, and as we moved from traditional cartography to digital methods, I got more interested in IT (I’d always hated computers at school!). So, I enrolled in a Masters program in Applied Computing at Dundee University. During my studies, I discovered that in the University’s School of Computing, there was a large group of people dedicated to researching better ways of designing technology with people with disabilities in mind. They believed that designing for people with diverse, and often extreme, needs, was the best way to design technology for everyone. This field really connected with me, so when I finished my Masters degree, I took a one-year research post—which turned into a career of over 13 years! I was a researcher, teacher and consultant in digital accessibility and inclusive design. I even managed to finish a PhD looking at the impact of web accessibility audits on organizational knowledge and motivation. I really enjoyed my time there, until an opportunity came up to join The Paciello Group last year. Well, while I’m occasionally on the road talking to clients or speaking at conferences, a typical week is spent at home in Scotland! The Paciello Group currently has around 15 consultants, and we all work from home. Homeworking gives me great flexibility in my working day. And Skype allows me to communicate by text or voice with my colleagues and clients, so I don’t get lonely! In any given week, I’ll be working on two or three projects, maybe more, and usually in teams with other colleagues. Projects might include auditing a web site or mobile app for accessibility, and producing recommendations for fixing barriers we find. I’m also increasingly involved in projects that involve more of a strategic accessibility partnership with organizations. For example, we might feed back comments on early design ideas, helping to head off any accessibility barriers before they become baked-in to whatever’s being developed. And a big part of my working week (though there’s never enough time!) is keeping up with developments in technology, in user experience design, and in improving the lives of people with disabilities. Twitter’s great for this! I’ll also usually be writing articles, papers, and generally thinking about and discussing new ideas for doing better digital accessibility. I’m always learning! 9. Can you tell us what a future accessible digital world might look like? Wow, that’s a good question! I think in simple terms, it’s a world where digital products and services are accessible out of the box, and we don’t have to worry about fixing things or repairing things. Systems and content will be designed with accessibility in mind. But also, people will be able to apply their own preferences to ensure that content is automatically and reliably presented in the most appropriate way. We’ve made a start with defining some standards for this kind of preference-based presentation, but there’s a long way to go yet. What else? Well, new devices for interacting with digital content will have assistive technologies integrated to such an extent that we won’t even call them assistive technologies—they’ll just be features we expect to be there. The iPhone has led the way here, and I’d like to see all devices that we might use to interact with digital stuff take the same approach. And, one great measure of how far we’ve come will be when people with disabilities can create (not just consume) digital content just as easily as anyone else.